Once adequate hemostasis has been achieved, the laser fiber is withdrawn and a thorough endoscopic airway inspection is carried out. Accumulated secretions, blood, and debris should be lavaged and aspirated thoroughly. We sometimes send part of the aspirate to microbiology for gram stain and culture in case antibiotic therapy is necessary. In our experience, however, relieving the obstruction is usually sufficient, and often precludes the need for antibiosis or steroids. Aspiration of debris continues as the bronchoscope is withdrawn from the airway making sure that the trachea and pharynx are not cluttered with secretions. 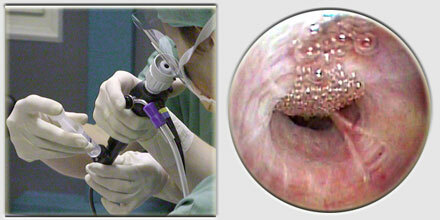 The bronchoscope should only be removed when the patient is adequately oxygenated and breathing normally.